Deciding who is to blame and who should pay for the financial crisis will be a hot topic at the G8 next week. Financial mathematics received a lot of bad press in the aftermath of the crunch and many believe that it was the popularity of mathematical models – often borrowed from physics — that put the financial system at risk. But now models borrowed from biology are helping us understand how this risk might be reduced. On 23rd September 1998, some of Wall Street's most powerful financiers met on the tenth floor of the Federal Reserve Bank of New York. They were there to discuss Long Term Capital Management, an investment firm that until recently had been one of the most admired in the country. With two Nobel laureates on its board and annual profits of 40%, the company seemed untouchable. As a result, banks had been happy to lend them more and more money, with fewer and fewer strings, to fund a complex investment strategy. Despite the pedigree of its creators, the strategy eventually failed. After a series of economic problems in Asia and Russia Long Term Capital Management was hit with catastrophic losses. When the bad news arrived, they still owed the banks over $100 billion. Worried that the sinking firm might drag others down with it, fourteen of Wall Street's biggest banks and brokers — who were now wishing they hadn't lent so much — agreed a bailout. By the time the meeting on the tenth floor of the Federal Reserve ended, they had agreed to prop up Long Term Capital Management to the tune of $3.6 billion. Avoiding financial disaster had proved costly but surely the lesson had been learnt? Not quite. Almost exactly ten years later, in September 2008, America's fourth biggest investment bank declared bankruptcy. Lehman Brothers had been hit with huge costs after clinging on to investments in dodgy mortgages (see How maths killed Lehman Brothers). After announcing losses of $3.9 billion on 10th September, they had tried desperately to find a source of financial support, but no saviour emerged. Rather than being the end of the banking crisis the collapse of Lehman Brothers was really only the start. As firms that had lent Lehman money found themselves out of pocket, mistrust flooded the financial markets. Who else was about to go under? Fearing the worst, governments intervened with bailouts to prevent the damage spreading further. The financial system is an intricate network of companies and countries, tied together by vast numbers of trades and loans. In the middle of the network, a handful of big banks carry out many of these transactions. The traditional wisdom is that bigger is better. By holding a larger and more diverse mix of investments, banks should be more stable: risks will cancel one another out. Until the 1970s many people thought the same thing about ecosystems. 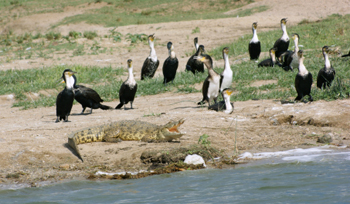 But when ecologist Robert May looked at what happened in mathematical models of animal populations he found that the muddle of interactions between different species could actually reduce the stability of the system as a whole. And big, complex ecosystems could be particularly vulnerable, because risks would spread rather than cancel out. Complex ecosystems are not necessarily more stable than simple ones. Researchers have now started to apply the same analysis to financial ecosystems. Nim Arinaminpathy, a mathematical epidemiologist at Princeton, recently published a paper in PNAS looking at the stability of financial systems. The article was co-authored with May and Sujit Kapadia, a policy advisor at the Bank of England. The trio looked at a hypothetical network of 200 banks, each represented by a simple mathematical model. The model divided a bank's financial position into assets, liabilities and capital. Assets included holdings in the form of cash or investments, as well as money lent to other banks. Liabilities covered anything that really belonged to someone else, such as deposits made by customers or money borrowed from other banks. Finally, capital measured the investment made by the bank's shareholders. The bank's finances followed the basic accounting equation, which underpins all modern bookkeeping: Assets = Liabilities + Capital. The researchers assumed the financial health of each bank could suffer in one of two ways. Either another bank could fail to repay its loans, thereby reducing the assets of anyone who had lent them money. Or the value of investments could slump, affecting how much a bank's holdings were worth. As in real life the network included a mixture of large and small banks. 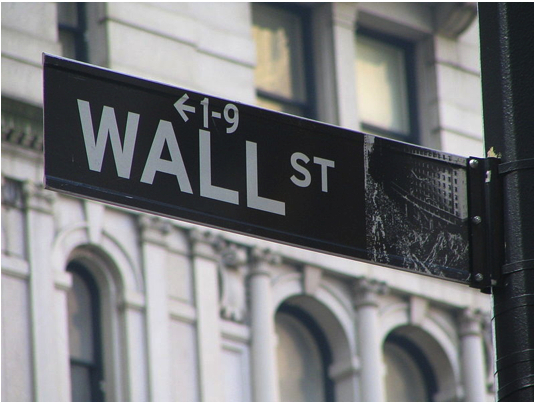 The researchers found that large banks were particularly important during a crisis. If one collapsed, it could have a surprisingly big impact on the health of other firms. Allowing the large banks to hold a more diverse range of assets didn't necessarily help protect the network either. More diversification meant a larger overall number of exposures. So if a big bank started selling off all these different assets to avoid bankruptcy, any other banks that held these assets would be affected too. Diversification might help stabilise an individual bank, but it can destabilise the network as a whole. The spread of toxic financial products in the build up to the 2008 financial crisis was like an epidemic. At the start, only a few firms considered putting money into complex mortgage-related investments. But as more hopped on the bandwagon, this infective idea passed from investor to investor until it had reached every part the network. Mathematicians have long been interested in how epidemics spread, and use tools such as the SIR model to understand what drives an outbreak. As well as showing how an idea grows, such a theory can also provide clues about how problems spread during a financial crisis. In particular, models can help us understand how the structure of a network influences disease transmission. For instance, during an HIV/AIDS outbreak, a person with lots of partners will spread more infection than one with few. If the network is assortative — with individuals with lots of partners interacting mainly with others who have lots of partners — the infection will spread quickly initially but soon burn out. However, if the network is disassortative — with high-risk people mixing with low risk individuals — the epidemic will be slower, but result in more cases. Unfortunately the financial network appears to be disassortative, which means any problems are likely to spread widely. 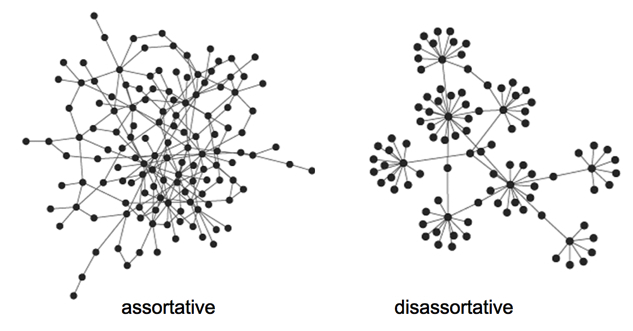 Examples of assortative and disassortative networks (Adapted from Hao et al. (2011) PLOS ONE, DOI: 10.1371/journal.pone.0028322). During a disease outbreak, health officials often focus attention on superspreaders: infectious people that can generate lots of secondary cases. The researchers looking at the banking network found that during a financial crisis the largest banks act as superspreaders. Because they are highly connected, they create a disproportionately large shock in the network when they run into difficultly. Rather than focusing on individual firms politicians are now looking into laws and regulations that account for how important banks are to the stability of the network as a whole. Although stocks of capital can help banks rebound from a crisis, larger banks often hold less of it than smaller firms. They claim this isn't a problem because their investments are diversified and so less risky. But analysis of the financial ecosystem suggests otherwise: diversification doesn't necessarily protect large banks from collapse. Firms that are central to the system therefore need to hold enough capital to balance against potential losses. Financial mathematics has received a lot of bad press since the collapse of Lehman Brothers. Many believe that it was the popularity of mathematical models – often borrowed from physics — that put the financial system at risk (see A risky business: How to price derivatives). There is a certain irony, then, that models borrowed from biology are now helping us understand how this risk might be reduced. Adam Kucharski a postdoctoral researcher in mathematical epidemiology at Imperial College London. In 2012 he won the Wellcome Trust science writing prize.